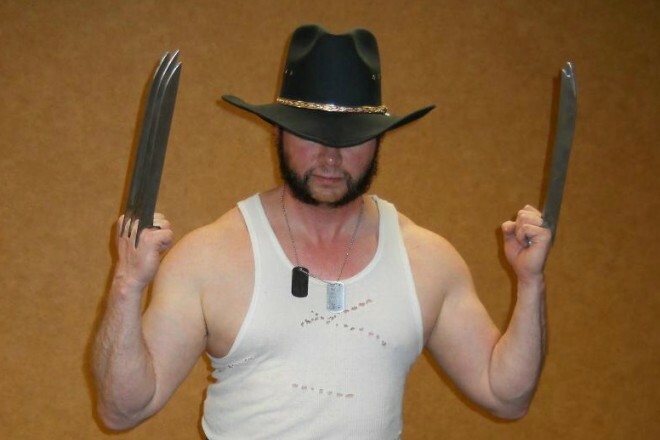 Wolverine is a pretty popular choice for cosplay. You see guys with their hair grown out and their bushiest sideburns wandering the floor of almost every con. Some decide to wear the bright yellow spandex. Some opt for jeans and a leather jacket. But they all opt for those amazing adamantium claws. They’re the accessory that makes or breaks the costume so no matter how cool the hair, if the claws look like cheap plastic, then the effect is ruined just a bit. Not a problem for Wolverine fan John Gibson. He went all out and enlisted the help of his cousin, Vic Hlushak, to create a custom pair of metal claws that look like they’re growing out of his skin. No, they’re not adamantium, but then they don’t actually sprout out of his hands either. They’re created out of metal flat plate and rod, and took a weekend afternoon to perfect. They measured each claw to fit John’s hand along and capture the look of the claws coming out of his skin. 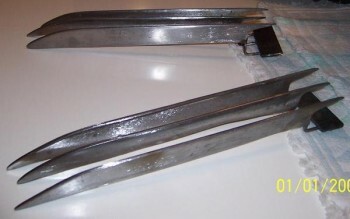 This is real metal-working, not something anyone can just throw together in their garage, but if you’ve got the tools on hand, Vic created a step-by-step guide for making these claws. He even includes a supplies list which surprisingly amounts to all of $12. I wish I knew someone who had the skills, because I’d make these in a second. And then I’d wear them on Halloween and scare the daylights out of all the neighborhood kids. Hey, if I’ve got these on my hands, who are you to argue, bub?